I have known I would be a writer since early childhood, when my third-grade teacher volunteered to read my stories and returned them with encouraging comments in the margins. Between then and now, I have written many short stories, two of which were nominated for the Pushcart Prize. My published writings also include poems, songs, magazine features, plays, op-ed commentary, radio essays for West Virginia Public Broadcasting, and a travel guide to West Virginia. A novel for children, Missing: Mrs. Cornblossom won a 2012 Moonbeam Children's Book Award. This is a story for children, families, and anyone you love. Writer Sarah Sullivan, author of Passing the Music Down, says: “ Colleen Anderson has the rare gift of turning the everyday world into something magical. Missing: Mrs. Cornblossom has a timeless feel. Readers of this story will be hooked from the very first page. Prepare to be utterly charmed.” Written for children aged 8-12, it’s also great read-aloud story for younger children. Look for it at bookstores, order from West Virginia Book Company, or contact me to get your autographed copy for $9.95 plus shipping. 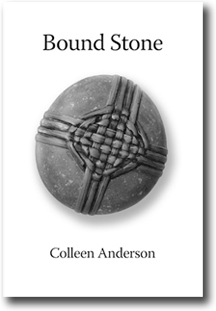 Published in 2016 by Finishing Line Press, Bound Stone is a chapbook of 22 poems. Jane Taylor, author of Pencil Light, says: “Colleen Anderson’s poems are like spirit houses. With each poem Colleen invites us to enter and consider our place in the world. I say we because the poems are deeply communal and steeped in universal human love and loss. Beautifully crafted and grounded in sensory images—the osprey, the sky, the river, the cloud, the deer—we are buffeted by time, yes, but never lost or alone. Read these lyric poems cover to cover and you will be spirited and etched by song.” Order your copy of Bound Stone from Finishing Line Press for $12.49 plus shipping.